Hedge funds have been struggling over the last several months as growth and momentum began to weigh on returns. Hedge funds are scrambling to rotate into defensives and away from stocks which have fallen out of favor. Data from Goldman Sachs suggests funds still have quite a bit of adjusting to do. In their November “Hedge Fund Trend Monitor,” analyst Ben Snider and team identified some reasons hedge funds have done so poorly in the second half of the year. One of the trends they noted was the underperformance of the 20 most concentrated stocks in the S&P 500. They explained that over the last 17 years, a portfolio containing these 20 stocks has outperformed the S&P 63% of the time. The average quarterly outperformance is 200 basis points. However, this time around, the basket of the 20 most concentrated hedge fund stocks has been lagging the S&P. The strategy is down 0.2% year to date, compared to the S&P's 2.4% gain in the same timeframe. The Goldman team said the basket was unusually weak in 2017, lagging the index by 11 percentage points. That was the strategy's worst performance in a decade. 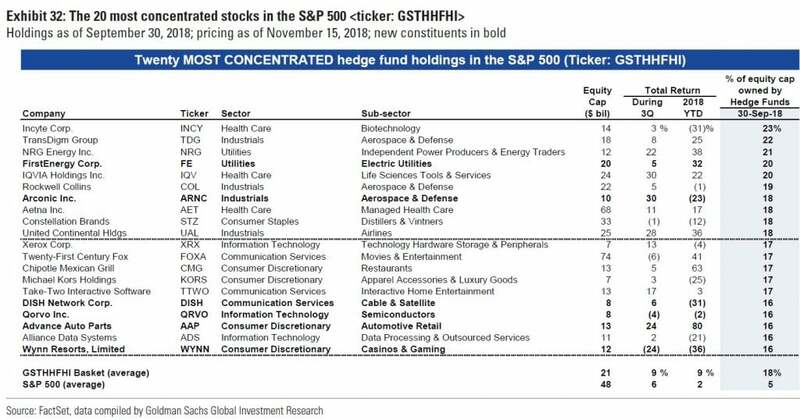 Snider and team explained that most of the funds in their "High Concentration" basket are mid-caps toward "the lower end of the S&P 500 capitalization distribution. They added that hedge funds own about 18% of the market cap of the average stock in the basket and 5% of the average stock in the S&P. The Goldman team also updated their "Very Important Short Position List," which includes 50 stocks in the S&P 500 which have the highest total dollar value of outstanding short interest. They also emphasized that the stocks in this list are not based on 13F filings and do not have the highest short interest percentages. In a further sign that tech stocks are falling out of favor, three of the top 10 stocks are semiconductor firms. Here are the top 20 biggest shorts, as listed by Goldman Sachs. We've seen commentary from several hedge funds on major semiconductor names this year. For example, Margate Capital said earlier this year that it has been bearish on semis for most of the year. In fact, the firm said in a recent investor letter that it may be a good time to short the sector, between over-shipping to distributors and the current trade war. This past summer, semis were on a tear, so it stands to reason that short-sellers would be paying attention to the sector. After all, high flyers like AMD and NVIDIA have been favorite shorts for more than a year. Other big names which are further down the list of top short positions, according to Goldman, include Oracle, IBM, Twitter, Cisco Systems, McDonald's and Coca-Cola. One other short position on the list that's particularly interesting is Activision Blizzard, which Margate Capital and one or two other hedge funds have highlighted as a key long positions in their recent hedge fund letters.